Today is the big travel day. Hours in the car. After a full breakfast in the dining room of this 18th century manor, complete with porcelain to eat our croissants and sip our coffee/tea, we walk across the huge garden with its century-old trees to our car. And we’re off. 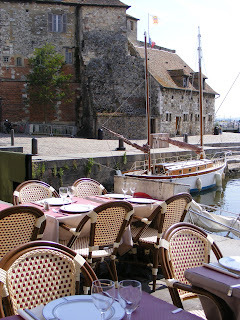 Our route takes us right past Honfleur, so I suggest a stop. It would be a shame to miss it when it’s so close. This is the town Samuel de Champlain sailed out of to "discover" the St. Lawrence and found Québec City. Located at the mouth of the Seine, it still functions as a fishing port. There’s a wooden church with two altars, side by side; the town grew so fast at one point that they merely put an addition on it, a mirror image, instead of building a new church. I’ve never seen that elsewhere. And many of the decorations were carved by the same hands that fashioned the sailing ships, with many of the statues looking vaguely like the figureheads on the bows of Champlain’s and other sailing ships of the period. After walking around and buying some chocolates, we decide to have lunch on the harbor, as the hour is appropriate and there’s a long stretch of road ahead. So mussels are ordered, which couldn’t be any fresher. And then it’s time to cross the futuristic Pont de Normandie bridge and cross much of northern France, up to Lille... where we get rid of the rental car, which proves the biggest challenge of the entire trip. Rush-hour traffic, one-way streets, ultra-narrow down-ramps into the underground parking. But not a scratch on the car - that’s the most important thing. And now we’re pedestrians and train-riders again. So we grab some food on the way back to the hotel - carbonade (beef stew) for me - and it’s sleep in the capital of the North. Day Four is set aside for finding my friend’s roots. Last night she was ready to just soak in Lille and call it quits. Overnight she’s remembered the name of the town her ancestor left in 1660 to settle a still mostly undiscovered, almost pre-colonial America. So the hotel clerk looks it up on a map, calls a taxi and we’re off. First the city hall, where the mention of 1660 meets with scarcely more than a yawn. Still, the lady behind the desk does do something vital: she corrects our spelling of the family name. Armed with that, we head off to the village cemetery, where we find the graves of several ancestors. When asked about that name, the man working on a tombstone tells us we should ask the marble cutter because he knows everyone. Unfortunately, that gentleman just left. On the way back to the town center, we pass the marble cutter’s shop and ring the bell. Mrs. Marblecutter notes down four people of the same name. I start calling them as we walk, but that leads nowhere. So we wander around town, and suddenly presto!, there’s one of the names on a doorbell. We ring. An elderly man opens the door... and we meet a lovely relative of hers - how many generations removed remains a mystery. We spend half an hour of his precious time, photos are taken, addresses exchanged and we leave with a new friend. Just time for some lunch in one of the town’s two cafés. Then the taxi shows up at the appointed time, quenching fears of being abandoned in this village outside of Lille. The taxi drops us off on the main square and we giggle at the harmless hazing of first year college students trussed up in silly costumes. The used book market is open in the old Stock Exchange, and it’s impossible not to buy something. My friend sees an Art Nouveau necklace in a jeweler’s window and we weigh the pros and cons of buying it over a cup of coffee in one of the terrace cafés. The verdict is pro, the purchase is made, and we return to the hotel to pick up our luggage and head to the train station. Only a 45-minute train ride separates Lille from Brussels, and a taxi whisks us to our hotel right on the Grand’Place. Although I’d told my friends where it is, they’re amazed when they see it and even more amazed when they look out the window from the hotel room and the square is right there at their feet. This is one of Sandy’s Little Secrets and if it ever disappears, I’ll be bereft. Precious antique furniture shares the scene with Big Lots beds, and a few of the light bulbs in the crystal chandelier will always be burned out, but who cares because... what a view! We spend a few hours having a most delicious and filling dinner - smoked salmon followed by various kinds of fish, each more beautiful and perfectly-herbed than the last. The décor is dark wood that’s been around for centuries, the waiter young and friendly, and the time passes faster than anything should, and then it’s time to return to our digs and watch people mill about on the vast square below. The lighting is golden and the moment perfect. Last morning of the road trip and we’re awakened by the sound of metal beer kegs being delivered to one of the many restaurants on the Grand’Place. Pushing the curtains aside, we discover that a far quieter florist has already set up half his greenery smack in the middle of the square. Suddenly a car pops out of nowhere and makes a mad dash across the forbidden immensity of cobblestones, hoping not to be noticed by the police, but reverses when it sees its escape route is a wrong-way street. After a hasty reconnoitering, it zips out of sight down another street. Obviously this is someone - a tourist? - who got there by mistake, as cars aren’t allowed on the square, not even taxis... only delivery vans. 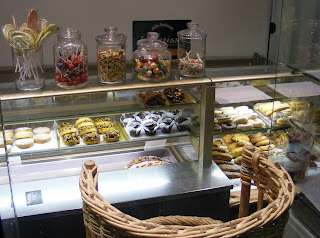 After breakfast, we’re off on the Pursuit of Chocolate, which is never very far away in Brussels. Once that yen is assuaged, we head out to see the Art Nouveau part of town. It begins with a new adventure for me: the Brussels subway. We manage not to get lost and end up on the hill overlooking the Old Town. Passing a corner restaurant, we see they’re serving mussels - moules - and we succumb. (At least two of us do.) Then following directions from a kindly passer-by, we try to cut through City Hall to the Art Nouveau area. Unfortunately the exit door is locked, so we go looking for another escape route. The caretaker, who has noticed our meanderings, leaves his lunch behind to unlock the door for us, with a heavy medieval key. Yet another random act of kindness, like so many others on this trip. After that, it’s one Art Nouveau house after the other, and a prison that was built to look like a castle so as not to vex the rich people of the neighborhood. The last stop of the day is at Horta’s house, turned into a museum, the summum of Art Nouveau. Then it’s back to the hotel to pick up the suitcases and scramble to the station. The train trip lulls almost everyone to sleep and the arrival in Paris is fraught with rain, recalcitrant cabdrivers and freakishly aggressive (and bad!) traffic. Luckily we make it back to home base unscathed, because that last part was nip and tuck. But we’ve seen so many lovely and wondrous things, and had such good times together. A truly successful road trip. The road trip begins with a train ride from Paris to Rennes, in Brittany, the west end of France. My two friends and I were supposed to pick up a rental car at the "downtown" office, which turns out to be in an industrial suburb, so we take a taxi there. Given that it’s on the east side of town, closest to Mont Saint Michel - our destination - we decide not to backtrack to sightsee in the city and instead head directly for MSM. 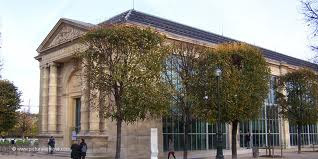 A bit of background: Back in my French university days, I bought my books for the Sorbonne at Gibert Jeunes, and made friends with one of the college students working part-time in the textbook department. Eventually he invited me to his house to meet his wife and friends, including one Christian. Years later Christian married a certain Nadia, who had a girlfriend Annick. Years after that (i.e. now) I return yet again to the country B&B of Annick and her now-retired husband Jean, in a farm house near MSM. And that’s how one thing leads to another. This visit I come with friends. Jean (and the cat, and Zazie, the cocker spaniel) are there to welcome us. Jean upgrades us from the small rooms initially reserved to bigger quarters - two full floors, all to ourselves! - and with a perfect view of the Mont just a few kilometers away. Later he escorts us to a hard-to-find place on the river to watch the mascaret, the equinox high tide that comes in at the speed of a galloping horse and creates a small wave crest... which is why we’ve come this particular day in September. Several times I’ve stood at the top of the Abbey and watched the high tide flow in, gradually surrounding the entire island. But I’ve never seen it from along the riverside, which is far more impressive. There’s just no way to explain the rush of the sea retaking what rightfully belongs to its water world. The water races towards us and then by us, four kayakers riding its crest. The noise level is surprising, like a flooding river, which is precisely what it is, really. And this has been going on since the beginning of time. It makes you feel very small and superfluous. Then Jean drives us to the Mont and shows us a way to circumvent the DisneyWorld-worthy 5,000-car parking lot that has been built to make MSM a hands-free zone. No more driving all the way out to the very foot of the island. Now you either walk the almost three kilometers or you take a push-me/pull-me shuttle bus that has replaced the space-age monorail project, deemed too expensive. I can’t tell you where this known-only-to-the-natives place is because I was sworn to secrecy. But the next day, when I manage to follow the route he traced for us in the dark of night, we break loose from the sheeple and arrive as free agents. It’s early in the day, so we’re ahead of the crowd. After 400+ steps, and a bit of rain, we reach the Abbey, and the amazements begin, one after the other... starting with how this ever was built to begin with, and how it has endured. The simplicity, and yet the amazing beauty, of every detail is striking, from the dimensions and sheer size right down to the unstained but patterned glass of the windows. On the terrace, there are marks of day laborers who hammered an initial or a number into each stone they set, so that the straw boss knew how much to pay them for their day’s work. From there, suspended close to the sky, where a lightning bolt is only a heartbeat away, you descend gradually back through time, from La Merveille to the refectory below, and then to Our Lady Underground, where immense columns support - literally - the thinner columns above. On through the room where a huge hamster cage is a reminder of when the Abbey - abandoned by the monks after the French Revolution - was used as a prison and prisoners walked endlessly in this wheel to pull up sledges lashed with food and all the other goods the jailers and their wards required. Then on through the crypt where the dead lay in wake, and on to the scriptorium... and then out into the mistyness of the village that grew up around the Abbey. We arrive back at the B&B to pick up our suitcases. Instead of which, we are regaled by Jean and Annick with a light lunch of garden tomatoes, quail eggs, cheeses and fruit fresh from their own trees. Then off to Bayeux. The road is modern, and we arrive in a little over an hour. Our hotel is one I’ve stayed at several times, after stumbling on it during a day trip. We’re welcomed like old friends and ushered to rooms that are picture perfect, right down to freshly cut flowers... in the bathroom! I accompany my friends to the Bayeux Tapestry, then excuse myself - I’ve seen it too many times - but still warning them where The Naughty Bits are... that’s so much fun to find in a historic monument. Later we meet up and walk through the Cathedral. The crypt has some fascinating ochre drawings on one wall and on the capitals of the columns, but we’re driven out by what appears, to the ear, to be an organ lesson... and of the Beginner Category. So as it’s dinner time, we discover a new restaurant - given that my usual one is closed on Tuesdays. There are oysters on the half shell, and scallops complete with both their parts in a delicious orange sauce. Plus the good conversation of old friendships. After which, there is bed. He talks like quicksilver. Don’t attempt a conversation with him if your French is shaky because the words come tumbling out, all a-race. Or rather, do have a conversation with him because he’ll enjoy it. Being all by himself in the shop can be a lonely business And it makes stopping for lunch impossible. The French have an expression for this kind of situation - on ne peut pas être au four et au moulin - you can’t be both by the oven and at the mill. 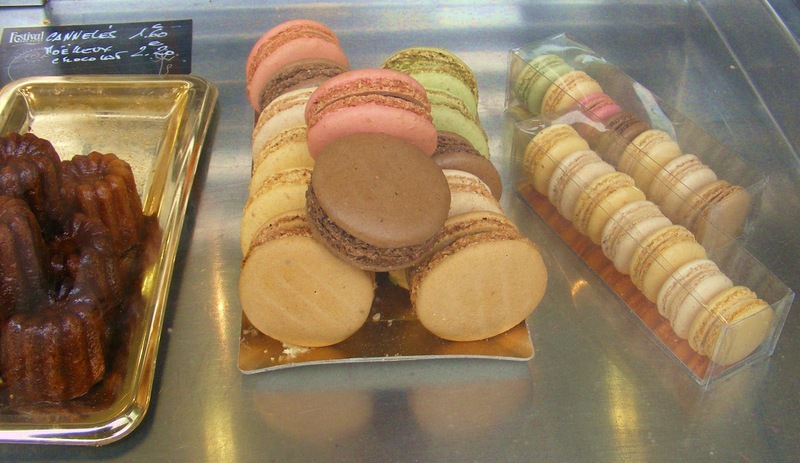 His name is Christophe - just plain Christophe - and he’s a baker. 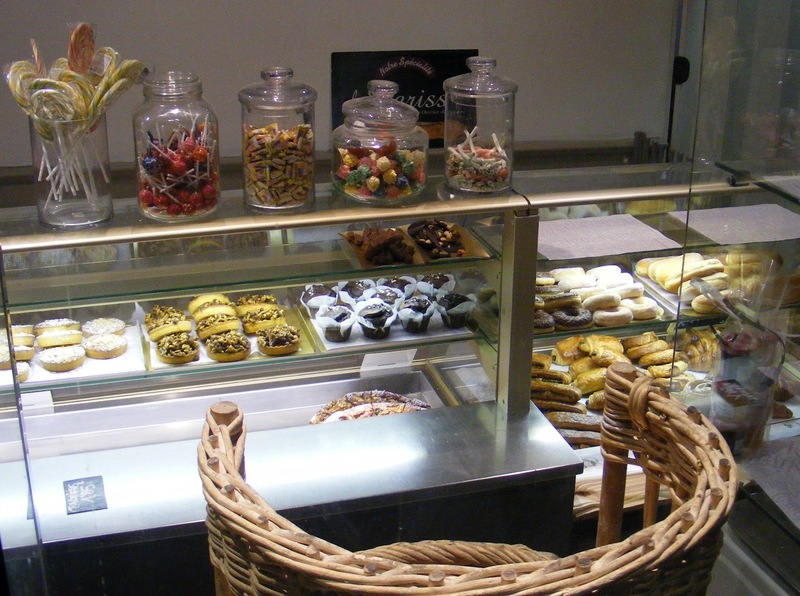 A baker of delicious French bread and pastries. He started learning his trade when he was only 14½, at schools that included traditional classes but also hands-on experience called pré-apprentissage, a sort of modern-day apprenticeship. He’s been baking almost ever since. 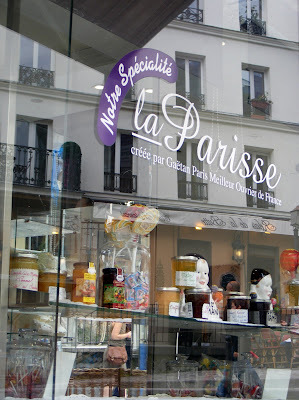 Now he has his own shop on a busy corner near the Bâteau Lavoir, where Picasso and many others painted their masterpieces and lived off of bread made by someone like Christophe, maybe at this very same corner. It’s on one of several tourist routes that wind their way up and down the steep slopes of Montmartre, so his clientele is made up of both locals and passing tourists from all corners of the globe. In addition to the two types of baguette Christophe bakes - the regular and the more traditional Parisse - he makes several other types of bread. There’s the round pain au levain made with natural yeast, not baker’s yeast, and he seems very proud of this, even though he’s a baker. (I’ll have to get him to explain the difference to me.) 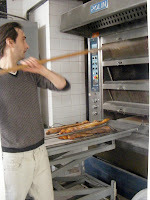 And he makes a pain aux céréales that includes six different grains. "Can you name them all?" I ask. And he starts to reel them off: "Linseed, wheat, corn, sesame ... sunflower and... and... and I forget." Then he laughs. 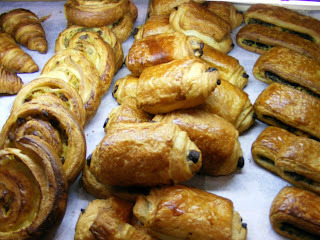 Christophe also bakes all the traditional goodies, the viennoiseries, that make up a French breakfast. Flaky croissants and sinfully satisfying pains au chocolat cuddle up next to crispy pains aux raisins and crunchy swirls of palmiers, not to mention the chaussons aux pommes oozing with applesauce filling, which my Austrian friend particularly liked for their name: apple slippers or "apfelschlapfen". There are also some breakfast creations of his own, such as his version of the gluttonously rich croissant aux amandes or the treat he calls a pain suisse because of its chocolate-and-crème-pâtissière filling. For the afternoon sweet tooth, there are the classic French shortbread-esque sablé cookies or his version of the good old American chocolate chip cookies - but his are a half-inch thick and a good 4" across. And there are donys, which you will recognize as being doughnuts. (I guess his spelling is phonetic, and he won’t correct it, in spite of my urging.) 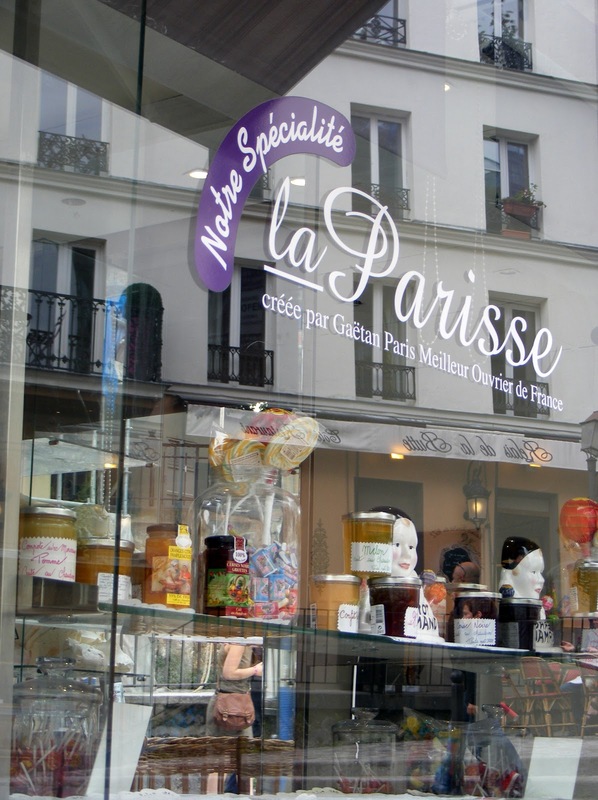 He offers a limited range of desserts (his shop is small) - mostly different tartes, the French version of the one-crust pie, crowded with fresh seasonal fruit and walnuts or pecans or pistachios. Or for something simpler, you can try his version of cheesecake. Even though he’s from Normandy, Christophe also makes his own cannelés flavored with rum and vanilla, a speciality of Bordeaux, and mouth-sized pastels, a Portuguese egg tart. And there are luscious mini-macarons of various flavors and meringues as big as a steelworker’s hand. For lunch you can pick up a variety of sandwiches made with his own baguettes or ask him to warm up a quiche lorraine in his small microwave oven, or the French version of a grilled ham-and-cheese, the croque-monsieur. In addition to all this, he stocks some candies for children on their way home from school, and cold soft drinks for the many gasping tourists whose tongues hang out as they trudge up or down these impressively steep slopes, too steep for any horse-drawn wagon back in Picasso’s day, even though this street was once the street - the only one - leading from Paris to the hilltop village of Montmartre. Christophe lives over the shop, like most artisans and shopkeepers in France used to (and still do outside of Paris). Five mornings a week, he’s at his ovens by 5 a.m and opens the shop at 8. The other two he often wakes up early anyway and loves to look out the window at the calm streets, take a deep breath... and go back to bed. That’s the luxury in his life. The rest of the time, he works hard until 8 at night, when he closes up the shop. It’s a long day. To make a baguette, especially the traditional kind, it takes a lot of kneading, which can be done by a machine, and folding, which cannot. A baguette takes 20 minutes to cook at 270°C (518°F) and his oven can hold 160 at a time. 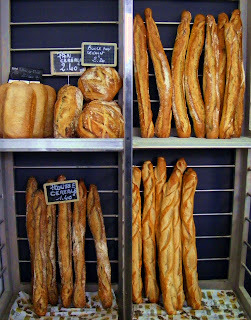 Each day, he bakes an average of four ovenloads of each type of baguette. And he rarely has any left. 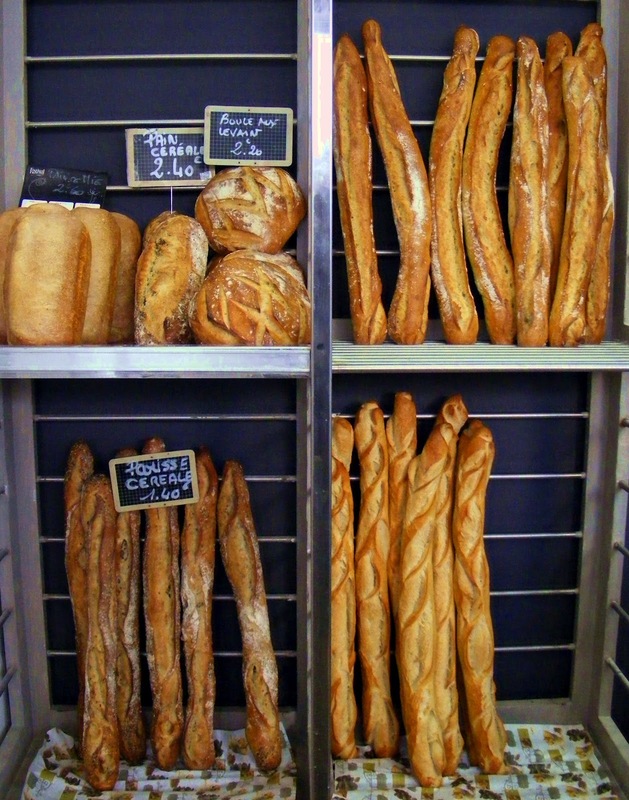 Bread is a staple of the French diet. In addition to all this baking, there have been long stretches when Christophe has also had to sell the goods he makes, shuttling back and forth between the oven and the cash register. Sales clerk is not a highly sought-after job in Paris. During the five years that he’s had this shop, he’s gone through at least ten of them. I’d tell you he’s being difficult in his description of the... uh, "lack of devotion" applicants have to their prospective job, except that my old baker friends the Bertheaus, and the Prandys before them, have already told me the same story. Mme Bertheau once said, "The first questions are ‘how much do I make’ and ‘what are my days off’, not ‘what are my duties’ or anything else like that." The exasperation in all their voices - and that stretches over a 40-year period - seems to be a leitmotiv in the French baker’s trade. Maybe that’s because there’s no room for advancement. I mean, the clerk is never going to become the baker; there’s already an apprentice in most bakeries just waiting to move on up. At present there’s a lovely older lady behind the register part-time most days. She’s trim, impeccably dressed and nicely made up. Very professional. Very French. At first I thought it might be his mother, but from some comments made, I’m thinking she’s not. Someday I may find out who she is. In the meantime, she’s taken the pressure off Christophe so he can concentrate on the making of delicious bread and pastries rather than the selling thereof. And it gives him someone to talk to, which he dearly enjoys. And we all want our bakers to be happy, don’t we? Some people leave a mark on history; some even leave their name. 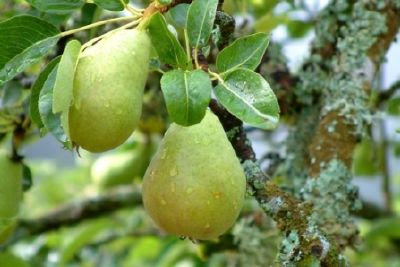 France has a pear with an English-sounding name: Poires Williams. I always wondered why. So for this recipe, I did some research. This pear, which Americans know as Bartlett, actually comes from Calabria and one was offered by St. Francis of Paola to French king Louis XI on the king’s death bed. This deed of kindness led to its first name: the bon chrétien (good Christian) pear. When it reached England in the mid-17th century, the name of a nursery gardener was tacked on and it became Williams’ Bon Chrétien pear, but that name was too long so the "good Christian" was left out. Then in 1799 it was brought to the United States by Enoch Bartlett, which is why Americans know it as the Bartlett pear. Williams (or Bartletts), both "Good Christians", are the most commonly grown pear outside of Asia. They’re popular for cooking and canning because they keep their shape well. They start appearing at the green grocers in late summer, so this is a timely recipe to make. And the spices are a nice touch when September evenings get chilly. Although the recipe uses wine, the alcohol will burn off, so there’s no danger of getting tipsy eating it. But you’ll still want to choose a good wine. Remember what W.C. Fields said: "I cook with wine. Sometimes I even add it to the food." 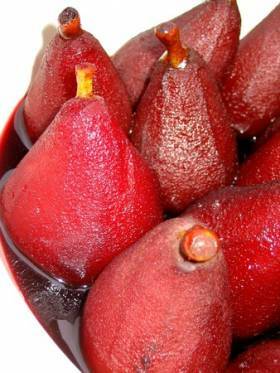 - To prepare the syrup for poaching the pears, bring the wine to a boil with the spices, zest, honey, vanilla and sugar. - Meanwhile, peel the pears. You can leave them whole or cut them in quarters, removing the seeds. If you leave them whole, be sure to keep the stem on. - When the wine boils, lower the heat. Delicately slip the peeled pears into the wine. Cover and simmer until they feel tender when stuck with a knife (20-30 min). 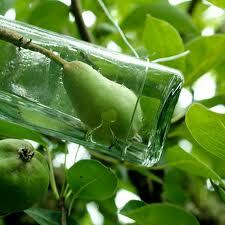 - Remove the pears and set them aside. - Reduce the syrup until it thickens and starts to coat a wooden spoon. Filter it and pour it over the pears. Once upon a time there was a palace with vast gardens dotted with orange and lemon trees. But this palace - let’s call it the Louvre - was in the north of France, where winters are too cold for citrus trees. So a building was constructed at the far end of the garden - let’s call it the Tuileries - to keep them warm through the winter months. And maybe because there were more orange trees than there were lemons, it was called l’orangerie. Then one day the king met with an unfortunate and somewhat sticky end a few steps from his orange trees, out on the huge square that’s now ironically called Concorde, where his head - the Head of State - was handily separated from the rest of him. And after things calmed down and a few centuries passed with no king at all and no citrus trees, it was decided - by the People, whose heads had communally replaced the disembodied Head of State - that it was a shame to let this building go to waste. Actually, that last part is just a fairy tale, because that king was beheaded in 1793 and L'Orangerie was built in 1852... although it was to house orange trees. Initially. But later, without a king who requires fresh oranges, it stood empty, used from time to time for sports events or concerts. And as a place for exhibits, ranging from dog or flower shows to trade fairs. Then came the Great War in 1914, and it was used to house munitions and to billet soldiers on leave from the trenches. 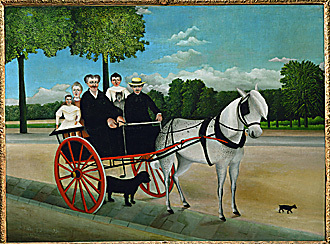 After the war ended, it was decided to use L’Orangerie as an art museum. 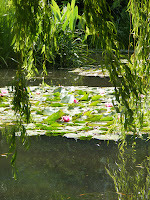 And that’s where Monet comes in. 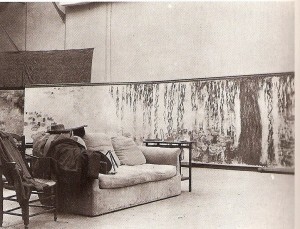 Monet and his Nymphéas. 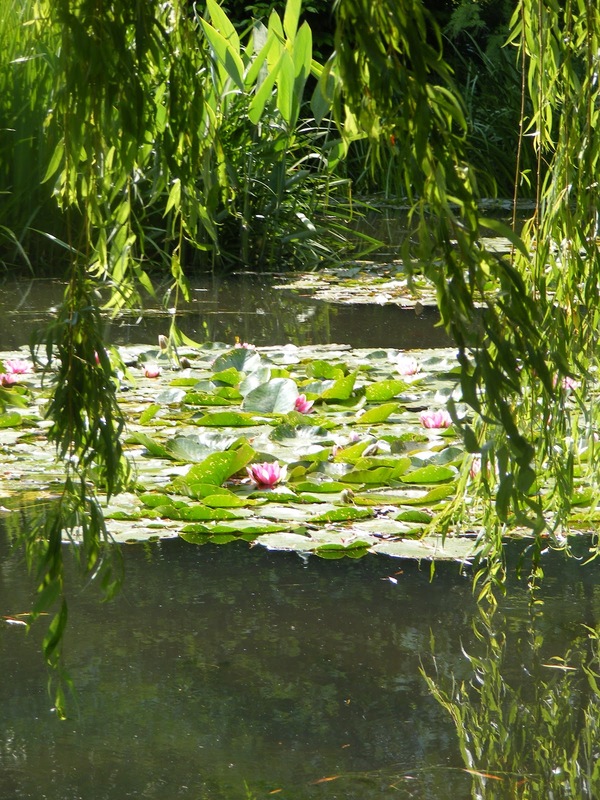 It was Monet’s gift to his country, and he worked closely with the architect to make the perfect setting for his water lilies, all 22 panels of them. He intended them to be an ode to peace, after the four long years of warfare France had just experienced. 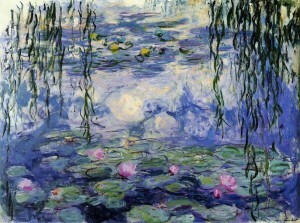 But for some mysterious reason, Monet refused to let anyone see them until after his death. Five months after he passed away the museum opened to the public. I saw them first when I wasn’t even a teenager. And when I saw them again decades later, I mentioned to one of the guards that they must have been moved since I was there last. She said no, they were still where they had been glued in place in 1927. 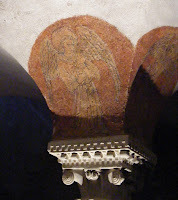 When I told her I remembered them being in a dark room, so they must have been downstairs, she explained the building had undergone six years of work to remove an added-on "attic" level and open Les Nymphéas back up to the light, so people could see them as Monet intended. You’ll find models of L’Orangerie’s different reincarnations on the library level as you go downstairs to see the other treasures of this small-but-mighty museum: the Walter-Guillaume Collection, an amazing collection of Impressionist and post-Impressionist masterpieces. Paul Guillaume was never destined to become one of the leading art dealers of his time. He came from a modest family and didn’t have a lot of education. 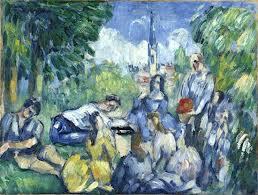 Then his parents moved near Montmartre. The Montmartre when Picasso and Juan Gris and Van Dongen were living and painting at the Bateau Lavoir right around the corner from my home here. 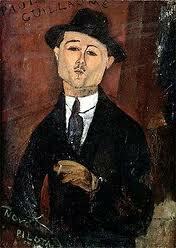 When Utrillo and Modigliani were roaming and boozing and baudy-ing the winding streets of the Butte. The artists’ works are hung pretty much in chronological order. First come the Renoirs, with their full-bodied, rosy-skinned women and the usual bouquets of flowers or scatterings of fruit. 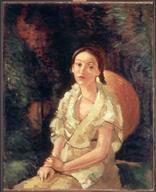 Then comes Matisse, and the Cézannes. But it doesn’t end there. Around the corner are room after room of Picasso and Derain, Utrillo and Modigliani, the post-Impressionists Soutine and Le Douanier Rousseau. There are probably more masterpieces here per square inch/cm than anywhere else, even in the sister museum across the river, the Musée d’Orsay. And most of these canvases will be familiar to anyone who ever studied this period in art history, because these are not just minor works by the titans of the era. These are the real deal. L’Orangerie is often overlooked by visitors to Paris, which is a mistake. 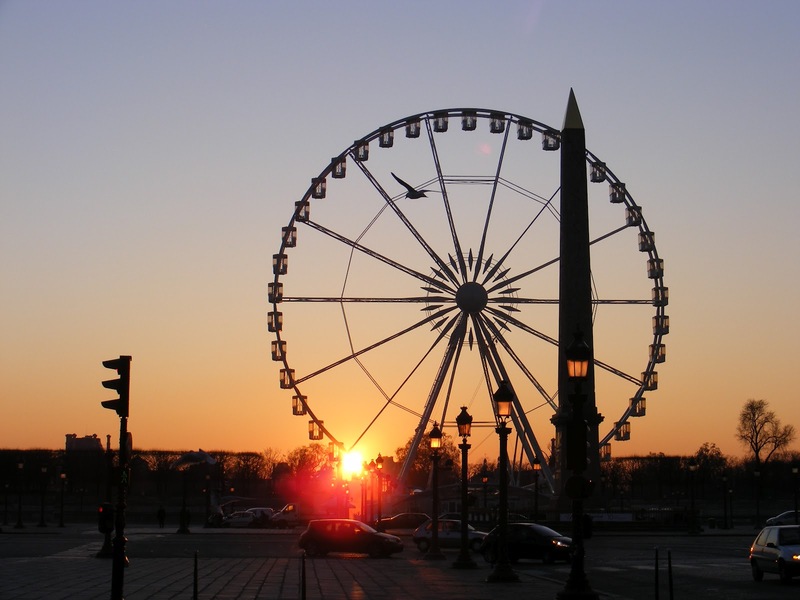 It’s conveniently located almost opposite the Musée d’Orsay, which you can reach by the quirky Senghor footbridge with its two graceful crisscrossed levels. It’s also a convenient and bucolic walk through the beheaded king’s Tuileries gardens, where you can watch children sail their boats in the fountain and enjoy Maillol’s voluptuous statues or sit under the chestnut trees and enjoy an overpriced cup of café. Plus its location above the Place de la Concorde gives you a perfect perspective for a killer photo of the Champs-Elysées, complete with the Arc de Triomphe in the distance. What more could a tourist want? Once again I strap myself into the Air France plane for my third transatlantic flight of the year. I yearn for the days when you'll be able to cross your arms and give a nod, like in "I Dream of Jeannie" - or wiggle your nose like Samantha - and be transported wherever you want in the blink of an eye... although I am a bit afraid of ending up with my head on the body of a fly as in the movie of the same name. Nonetheless, I’ve gotten to the point where I’d be willing to try. Eight hours is a long time cramped up in a winged box with hundreds of other people sneezing into the common air. Lord knows, Air France crews are a genteel and helpful lot, but when every single seat is taken and you’d dearly like to be able to "stretch out" over just two of the bloody things but you can’t because (see above), and then the person in front of you puts their seat back, almost knocking over the beverage on your dinner tray and making it impossible to see the movie you’d missed when it came to a theater near you... well, just about at that point time travel begins to looks like it would beat the pants off flying in what is so appropriately named an AirBus (not that Boeing is any roomier). They say these planes don’t offer less legroom than before, but I have a carry-on that used to fit under the seats and doesn’t any more. Somehow I don’t think it’s the carry-on that grew. So here I am - finally! - walking down the street to my door. Inside my white gates, the garden is a sad picture. The central garden is totally bare, with only the campanulas around the edge, and the two dwarf rosebushes, and one fuchsia in a sorry state. The other has died, as have all the impatiens that had made a carpet of white and pink. A quick look around shows the containers bordering the walls have fared better, except for the fosythia and jasmine - totally wilted and very possibly dead. And the Indian paintbrushes, which will never paint anything ever again. As for the windowboxes, the morning glories I planted are magnificent with blue flowers, although their background of yellowed leaves spoils the picture a bit. The nasturtiums are gangly and the daisies are practically daisy-less but their greenery looks fit. The lobelia looks blue in more than color, and only one seems to have survived. As for the geraniums and lavender, just call the undertaker. Amazingly, the herb garden on my front steps looks pretty good. The basil and sage have gone to meet their Maker, the thyme is totally dried and suitable now only for cooking, plus the mint and verbena look sad. The parsley, on the other hand, is magnificent and full, as is the rosemary. The bay leaf hasn’t grown as much as in the past, but it hasn’t given up the ghost either, which isn’t bad under the circumstances. Because, you see, there has been precious little rain in Paris. It all seems to have fallen from the sky in June and July, leaving none for August. That, combined with 100°F temps for a few days in a row last week and the absence of my two neighbors who usually water when I’m away, have left plants with their little tongues hanging out. Inside, on the other hand, the apartment is cool. And yet about half of the flowers are dead. They’ve gone almost a month without a drop of water. But that damage is soon repaired with a first trip to the florist. A new azalea, a second African violet and a brilliant red cyclamen for a splash of color where something whose corpse looks totally unfamiliar now slumps. After considerable watering as soon as I set down my suitcases, and then again that evening - and then again the next morning - stock can be taken. "Bring out your dead," I think, echoes of the plague of the Middle Ages. On close inspection, every single leaf on the forsythia I planted my first summer in this house is withered. But when I scratch one of its branches, the wood is still green underneath. Hopefully that means that it will re-flower in the spring. We’ll just have to wait and see. Nicole’s jasmine is a little harder to decode; it looks hopeless, but maybe there’s still a chance of a resurrection. It should be obvious by the time I leave, which is many weeks away. After several trips down the hill and back up, I’ve moved the dried-up lavender to the central garden for what garden planners call "interest", and potted fresh lavender in its place. I’ve also replanted the indoors azalea here in the hopes that more ground may help revive it; can’t do any harm, right? The impatiens have been replaced by five cyclamen: pink, red and white. Plus two purple shamrocks to keep company with the one poor scrawny survivor of both plaster-choking work on the building and the Arctic cold of last winter. By the gate, purple veronica rising from white-bordered greenery has replaced the dead Indian paintbrushes. And the bathroom windowbox is again colorful with kalanchoe. The next morning, the garden still seems dark and a bit sparse in the center so I take a chance that the Oriental couple are back now from vacation and open for business. Although they’re the farthest downhill, they’re also the least expensive. Sure enough, they have some pansies for only 1 euro a pop, so I stock up on one tray of ten and head back uphill. I set them out to see where to plant them for maximum effect. The bright yellow pops in the shadows of the cherry laurel tree above and brings the whole thing together. So in they go. My garden is officially back in business. Suffice to say I’m now on a virtual first name basis with the two florist shops that have endured, as Faulkner would say. 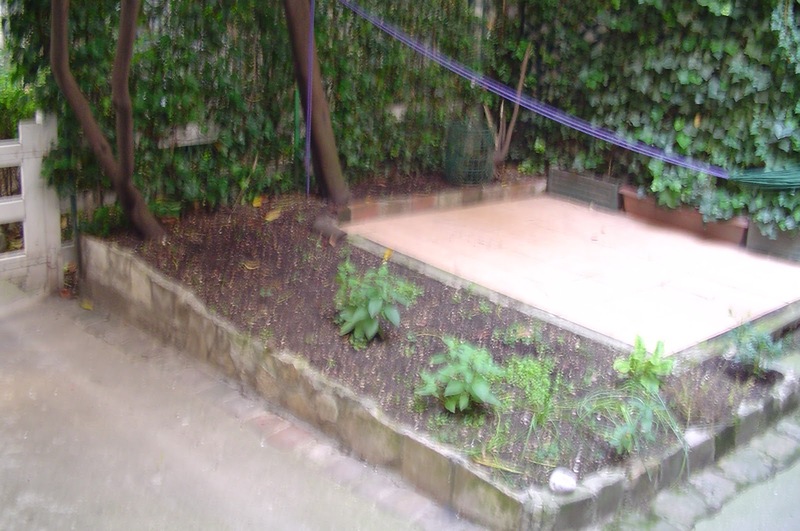 The garden is still a bit sparse compared to what it was in the spring, but it will do for my purposes. We’ll see what winter will bring. Last year was a killer, with cold such as Paris rarely sees and crusty snow on several occasions. In late February an entire week went by with the thermometer never making it above freezing. Already, on the last night of August, it has snowed in the Southern Alps, but I’m told by the natives that it’s only on the summits, and that’s normal at this time of the year so it shouldn’t be taken as an omen of frigid things to come. From their lips to God’s ear. As for me? I’m sitting in the garden with a glass of wine and a good book. So... cheers!